In the face of the Lhasa protest, the Chinese Communist Party will attack Tibetan dissent with a grim combination of determination, desperation, and relish, and deploy every police, military, political, propaganda, informational, and diplomatic resource it possesses, even as the government struggles to maintain the smiley face China Rising facade for the Olympics and the international community. Commentary by China Hand. 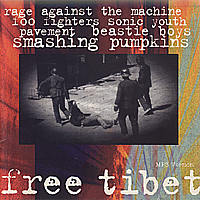 Click here to download the Free Tibet Concert 1996. Tibetan regions of the People's Republic of China are experiencing a level of unrest that hasn't been seen for 20 years. Anti-China and/or pro-independence demonstrations have occurred far beyond Lhasa and the Tibet Autonomous Region. Thousands of monks have reportedly demonstrated at the Labrang Monastery, a major Yellow Hat temple in the Amdo Tibetan ethnic region, a.k.a. Gansu, not too far from Lanzhou. This is a major public order crisis for the People's Republic of China. The genie of Tibetan insurrection has to get put back in the bottle before dissidents get emboldened and the PRC's rule over a quarter of its landmass starts to look less like occupation and more like counterinsurgency. Holding on to political power is the one task the Chinese Communist Party is purpose-built to accomplish. One of its critical arenas has been Tibet, which has endured invasion, occupation, the deaths of perhaps a million of its citizens and a brutal, 50-year effort to fragment Tibet's political, ethnic, and cultural identity. The CCP will attack Tibetan dissent with a grim combination of determination, desperation, and relish, and deploy every police, military, political, propaganda, informational, and diplomatic resource it possesses, even as the government struggles to maintain the smiley face China Rising facade for the Olympics and the international community. The question that is roiling the Chinese government and, perhaps, the Dalai Lama's government in exile in Dharmsala, is whether this represents a change in tactics, a new upsurge in militancy, and/or a challenge to the leadership of the Dalai Lama in Tibetan affairs. Early reports on the violence trotted out the "ethnic powder keg" line, linking the disturbances to the Chinese beating a couple of monks in Lhasa, then reaping the whirlwind of outrage. Senator Obama misses the significance of March 10, 1959; in addition to being when His Holiness the Dalai Lama fled into exile, it was when Tibetans across Tibet rose up against the Chinese occupation of their country. So while we appreciate Senator Obama's support for Tibetan autonomy, we would be much happier if he recognized and supported what Tibetans are literally dying for in the streets: independence. I have to admit that I wasn't aware that March 10 is officially Tibetan National Uprising Day, usually commemorated by remarks by the Dalai Lama and demonstrations protesting the Chinese occupation. And this year March 10 served as the occasion for activism inside Tibet as well. The day seems to be silent and peacefull, even boring. Until 6 o´clock. Then hundreds of Tibetans gather together on the Bakhor Square. They form a strong, silent, peacefull circle around the police who keep the middle of the square open. Soon they call for backup. Undercover agents, not so difficult to recognize, film the whole happening. Especially the faces. This is one method to create fear. Suddenly there is panic. Six or seven monks are arrested and driven away. So obviously something was planned. March 10 is officially Tibetan National Uprising Day, usually commemorated by remarks by the Dalai Lama and demonstrations protesting the Chinese occupation. And this year March 10 served as the occasion for activism inside Tibet as well. Which brings us to the imposingly named Tibetan People's Uprising Movement. The signatories to this declaration are the Tibetan Youth Congress, Tibetan Women's Association, Gu-Chu-Sum Movement of Tibet, National Democratic Party of Tibet, and Students for a Free Tibet, India. As I understand them, these are legitimate NGOs with significant standing inside the emigre Tibetan movement. (I would welcome knowledgable comments as to whether I am misinterpreting or overstating the standing of the Tibetan People's Uprising Movement, hereinafter TPUM). Besides the heads of the five Organizations, the three-day workshop was also deliberated by Mr. Karma Yeshi, Member, Tibetan Parliament in Exile and Editor in Chief, Voice of Tibet, Ven. Lobsang Jinpa, Editor, Sheja (Tibetan Newsletter), Mr. Tendor, Deputy Director, SFT Headquarters, New York and Mr. Lobsang Yeshi, Former Vice President, Tibetan Youth Congress. The training subjects include the Importance of Co-ordinated Movement, Contemporary Chinese Political Scenario, Strategy and Vision, Situation inside Tibet, Olympic politics, Media and Messaging, Non-Violent Direct Action and Fund-Raising Strategy. I think one can also take it as a sign of the movement's importance that their website, which is certainly blocked inside China, is apparently being disrupted at its source by the Chinese. The links I've provided above gets you to the archived pages, but I've been unable to access the home page, getting the "This page cannot be displayed" error message. If the Chinese really are hacking the TPUM site, or even just launching a denial-of-service attack, that will provide ample food for thought for people concerned about Chinese cyber warfare intentions. James Fallows reports that inside China, main foreign media websites aren't blocked, but any page with the words Tibet are. SFT reports that all Youtube is blocked, a recognition of utility of video in breaking down censorship (no keywords to catch) and the extensive use of Youtube by emigre Tibetans. TPUM's key public March 10 action was to be a march to the Tibetan border from India, something that was quickly squelched by the Indian authorities with the arrest of 102 people. The Dalai Lama himself, in this year's March 10 message, explicitly supported the Beijing Olympics, which puts him at odds with the Tibetan People's Uprising Movement. One doesn't have to choose between the local powderkeg and outside agitator narratives to wonder if there was any coordination and planning between the demonstrators inside and outside Tibet. I have, from the very beginning, supported the idea that China should be granted the opportunity to host the Olympic Games. Since such international sporting events, and especially the Olympics, uphold the principles of freedom of speech, freedom of expression, equality and friendship, China should prove herself a good host by providing these freedoms. Therefore, besides sending their athletes, the international community should remind the Chinese government of these issues. I have come to know that many parliaments, individuals and non-governmental organisations around the globe are undertaking a number of activities in view of the opportunity that exists for China to make a positive change. I admire their sincerity. I would like to state emphatically that it will be very important to observe the period following the conclusion of the Games. The Olympic Games no doubt will greatly impact the minds of the Chinese people. The world should, therefore, explore ways of investing their collective energies in producing a continuous positive change inside China even after the Olympics have come to an end. The Dalai Lama is, as usual, right. The possibility that the current Tibetan uprest will dim the luster of the Beijing Olympics is already making Chinese go nuts on the message board (see Rebecca Mackinnon here), eliciting the extreme Chinese chauvinism and defensiveness that makes any kind of rapprochement with the Tibetan government in exile almost impossible. Which brings us to the question, what is TPUM thinking? Did they want to provoke a crackdown that would create a groundswell of Western support for boycotting the Beijing Olympics? Certainly, if anti-Han activism in Tibet and abroad turns the Olympics into a humiliating diplomatic and public security ordeal, instead of a triumphant coming-out party, the Chinese are going to take out their frustrations on dissent in Tibet. Assuming that Tibet Uprising has thought this thing through, the conclusion would be that they are consciously trying to elicit Chinese over-reaction, exacerbate the crackdown, and alienate more and more Tibetans from the idea of accommodation with the PRC. In other words, think of Tibet as the new Gaza. The occupying power games the political/diplomatic system to counter criticism, but relentlessly extends its military and economic reach inside the territory. The occupied turn to militancy. They attempt to create an atmosphere of intense bitterness and anger on the ground through direct action and by the creation of a new generation of militants in religious schools. The objective is to marginalize moderate and co-optable forces, make a successful occupation impossible militarily, politically, and socially, and finally compel the oppressor to give up and withdraw. An interesting idea, except it hasn't worked in Gaza, even with sub rosa aid from Iran. With the Tibet independence forces actively opposed by India and the United States and just about every other government I can think of, I wouldn't think that such an approach would succeed in Tibet. And it would also involve abandoning the moral high ground that the Dalai Lama has assiduously cultivated for 50 years, turning an esoteric religion and feckless ruling class into beacons of righteousness and hope. A posting on SFT makes a tortured attempt to reconcile the looting of shops and attacks on Han Chinese in Lhasa with principles of non-violence. But there's something about an overturned burning car that says "angry rioter" instead of "nonviolent martyr", and I'm sure that the PRC will be able to come up with some atrocity photos of some beaten up, burned, and/or killed Han shopkeepers if they need to. If world opinion starts to regard direct action in Tibet as a Buddhist intifada led by confrontational hotheads, with monasteries and nunneries filling the role of extremist madrassahs, then the international opinion that stands between China and the most brutal public security and occupation measures may crumble and leave the Tibetan independence movement worse off than it is now.